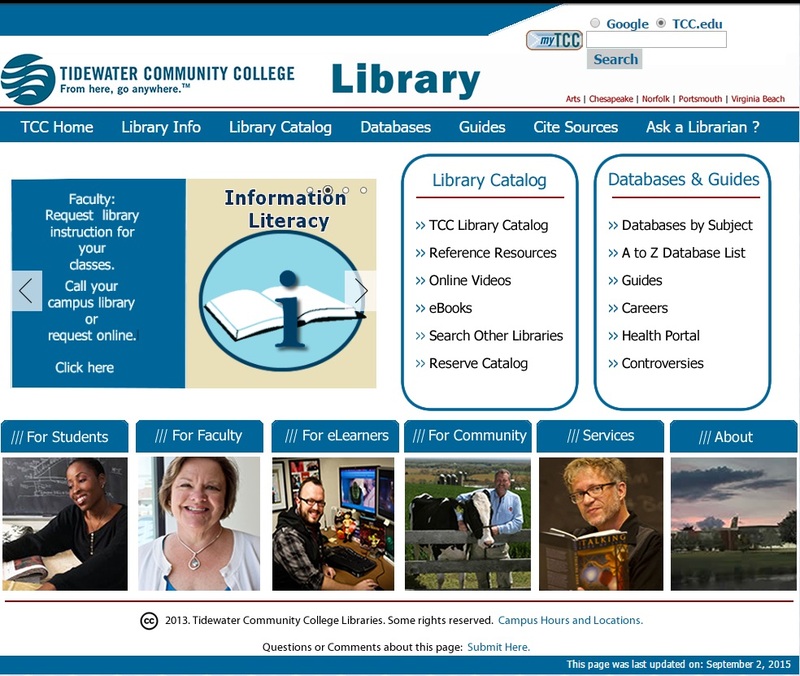 In the fall of 2015, the librarians at Tidewater Community College decided use LibGuides in order to redesign the library website. Using LibGuides offers librarians the opportunity to quickly and easily edit the website and maintain control rather than outsourcing web control to an outside developer. The benefits of using LibGuides as a design platform are discussed, as well as the limitations and challenges. A. Garrison Libby and Joy L. Yaeger, "LibGuides as a Platform for Designing a Library Website," Virginia Libraries 62, no. 1 (2017). DOI: http://dx.doi.org/10.21061/valib.v62i1.1463. In the fall of 2015, librarians at Tidewater Community College began designing a new library website.1 This article elaborates on the process of using Springshare’s LibGuides (https://www.springshare.com/libguides/)2 as a platform for development and its benefits over a traditional HTML website, as well as the drawbacks to consider. Overall, LibGuides is an excellent platform for creating an easy-to-maintain website that does not require a staff member proficient in HTML and other web design code. During the fall of 2014, Tidewater Community College announced plans for creating a new college website that would be developed to appeal to the student of the 21st century. While the college had plans to create web pages for all of the TCC departments, it became evident that it was necessary for the library to keep control of their website design and updates for a variety of reasons. 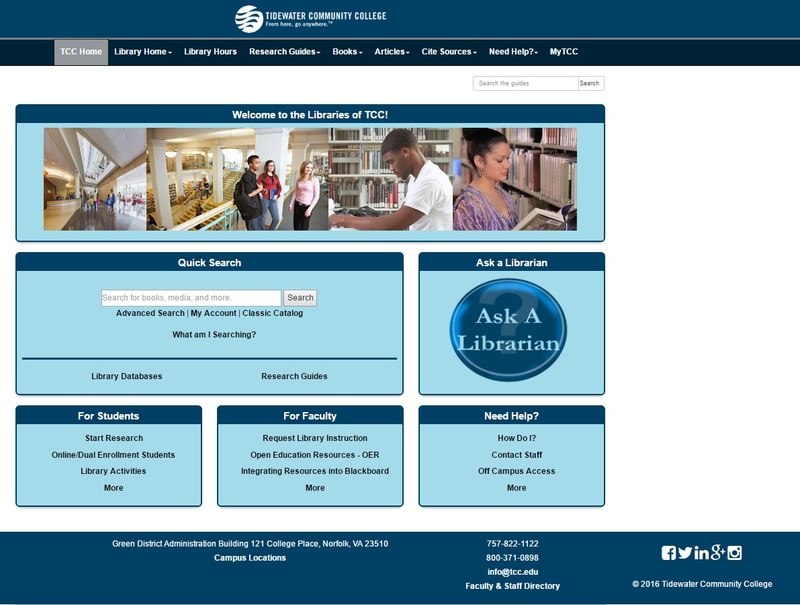 The website team for TCC saw this re-design as an opportunity to transform the library website. However, they were conducting this transformation without understanding the unique needs of the library and the specific features a library website requires to support instruction, distance learning, and academic research. The prototype design that was developed was reviewed by TCC librarians, who determined it to be ineffective for students needing the support and services the libraries provide. Because of these concerns, the Web Librarian and Associate Vice President for Libraries pressed the TCC website team to allow the librarians to redesign the homepage themselves in order to better meet the needs of students and faculty. … TCC librarians took the opportunity to craft a new library website in line with the college website standards, with enhanced utility for library patrons. In response, the TCC librarians took the opportunity to craft a new library website that would be in line with the standards of the college website, as well as have enhanced utility for library patrons. The old version of the library website was created in Dreamweaver using sections that were constructed from coded graphics. It required extensive effort by the Web Librarian to make even a small change on the website, and maintenance involved knowing advanced coding. Furthermore, the style of the website was outdated with older coding that was not responsive for mobile devices. Previously, the website was housed on the TCC server, which required the Web Librarian to continually work with the Office of Information Systems to make sure that elements of the website were not accidentally deleted or changed. In addition to the homepage created in Dreamweaver, TCC also used LibGuides to host a set of research guides, as well as miscellaneous other pages such as citation tutorials, policy information, and pages detailing the individual campus libraries, creating a fragmented web presence across multiple platforms. When the library’s LibGuide and Website (LAW) Committee first undertook the task of creating a new website, there were key elements from the old website that needed to be addressed and upgraded for the change. New visual identification standards from the college needed to be integrated into the webpage, and the old website had some accessibility issues with the design. In addition, in terms of usability, the website was busy and cluttered, making it difficult for students to navigate the website for research needs. Test prototypes of website designs were constructed based on the feedback from the TCC Library survey that is dispersed annually at the college. Feedback was also solicited from the librarians who use the website as their main instruction tool for teaching information literacy sessions. … Test prototypes of website designs were constructed based on: feedback from the annual TCC Library survey and feedback from librarians and students. After reviewing the options for a new homepage, the committee decided to create the website using the LibGuides platform. LibGuides offered several benefits over creating another page in Dreamweaver or HTML. Although there is some loss in flexibility, the familiarity and ease of use to librarians, along with the ability to make updates quickly without relying on the college’s central web developers, made it the ideal choice. The library already subscribed to SpringShare’s LibGuides CMS platform and other products, such as LibWizard and LibCal, so the decision was made to use LibGuides because it integrated products the library already used regularly, and using a single platform for all aspects of the library’s web presence created a unified look a feel. Additionally, the librarians knew that Springshare’s LibGuides offered backup and technical support to assist in the maintenance of the site. It is worth noting that other platforms are available that provide similar easy-to-use website building tools, such as WordPress and Google Sites. These are also viable options, and librarians may want to consider them as well. … The design team consisted of the four members of the library’s LAW Committee and included members of TCC’s different libraries. The design team consisted of the four members of the library’s LAW Committee and included members of TCC’s different libraries. The team met regularly to determine the most important features to include in the new website and what needed to be prominently featured and visible for patrons. Along the way, input from the full library staff was gathered at librarians’ meetings to ensure that all staff members had a voice in the design process. Visual consistency with the main TCC homepage was also maintained so that the central web staff would not reject the library’s plan and replace it with something of its own design. As the design began to take shape, the web librarian also presented prototypes to students to solicit feedback. Because students are the primary target audience, it was critical to ensure that the page was easy to navigate, and students were able to access important resources such as the library catalog, databases, and chat function. Through successive usability testing with students and input from the librarians, a final design was reached. The new website offers several key improvements over the previous version. An embedded search box to Primo, the library’s discovery tool, is prominently located so students can quickly search the catalog and many of the library’s databases. Below, are links to the full list of library databases and research guides so that students needing more specific resources can conveniently access them. The “Ask a Librarian” button, which links to TCC’s library chat service, is also placed prominently, as well as contact information for each library. This places the most critical features in the same general vicinity of the homepage where they are highly visible. The columns below divide up sections for students, faculty, and general help. The navigation bar at the top appears throughout all TCC LibGuides and is a consistent way to access those same key links on any TCC library page. … Librarians interested in pursuing a redesign using LibGuides or a similar platform should determine at the outset whether they will use custom coding or only the tools provided by the platform. The website was built using LibGuides, but additional coding was used to ensure the columns were evenly spaced and to create the navigation bar. One of the benefits of LibGuides is that, although it does not require additional coding, it can be used to enhance a web page. At the time of creation, TCC had an additional librarian able to code in HTML, CSS, and bootstrap, but the decision was made to limit the use of custom code so that any individual could run the website in the future regardless of their knowledge of coding. Librarians interested in pursuing a redesign using LibGuides or a similar platform should determine at the outset whether they will use custom coding or only the tools provided by the web development platform to help guide the creation of the website and ensure that staff transitions do not interfere with maintenance in the future. The new website launched in the spring semester of 2016. Response from students and faculty was overwhelmingly positive, with praise for the navigation and ease of use. Since then, the LAW team has continued to refine the library website based on ongoing feedback and recognition of common issues. However, no major overhauls have been necessary. Is it worth using LibGuides for the library website? For the TCC libraries, it has been a positive move. LibGuides offers several key benefits as a platform for a website that makes it a viable alternative to traditional website design. Most importantly for TCC librarians, LibGuides allowed the library to maintain control over its website. Rather than being built by an outside developer and maintained by TCC’s central web team, the site is under the control of TCC librarians. Librarians are in charge of the site’s content. LibGuides is easy to use and update. Although the TCC library homepage is enhanced with additional coding, it is not necessary, and a homepage can be built by anyone familiar with the LibGuides platform. A dedicated webmaster, fluent in HTML and other programming languages, is not necessary. However, it does help to have someone familiar with web design and usability principles to ensure that the page is easy to use. In the event of staff transition, management of the library website can be passed quickly and easily to other staff members. Although the web services librarian is the primary staff member in charge of the site, the LAW team has full rights to edit the site’s web pages as well; therefore, any one of them can make changes as necessary. LibGuides is an ecosystem with which the entire staff is familiar. Any librarian who has worked with LibGuides can understand the column-and-box layout, and it is also intuitive for students to understand and navigate. LibGuides also provides consistency with the rest of the library web presence. All of the library’s research guides and information pages are built in LibGuides, so there is a consistent look and feel throughout the website. A common header and navigation bar runs across all library web pages, further ensuring consistency and style throughout. By default, LibGuides is a responsive platform. It automatically adjusts pages to display in a mobile-friendly view if users access the site from their smartphones or tablets. The new mobile version allows students to use the website on a variety of devices. For example, students are using iPads that utilize the mobile version of the website in TCC’s Joint Use Library classroom. Springshare has an excellent support staff who can assist with troubleshooting. Additionally, they offer the Springshare Lounge (http://springsharelounge.com/), a discussion forum where LibGuides users can swap tips and troubleshoot one another’s guides. Both of these options can help to quickly solve any issues that arise during the design process. Although LibGuides is simple to use and does not require extra coding, that also limits design options. Barring advanced coding skills, librarians are forced to use the column-and-box setup of LibGuides to design webpages. Although effective, it does limit other potential options for page design. LibGuides does not have extensive support for backups. Although HTML backups can be made, there is no easy way to return to a previous version of the website. If content is accidentally erased or something critical happens to the site, or a single page, it may require recreating previous versions by hand or contacting Springshare for assistance. During any downtime, that could leave the library without a functional website. Communication is critical. While LibGuides allows multiple users to be editors on a page, there must be a plan to maintain web pages. Four different users should not edit a page freely. A set structure should be in place from the outset so that editors know when they might need to make changes and who should be in charge of doing so. At TCC, the Web Services Librarian was designated the central person in charge of the website. If she is out, the remaining LAW members must communicate before making any changes to the site. Furthermore, ongoing communication with library administration and the central web development staff is necessary to ensure that the site is complying with TCC’s web standards. Despite these few drawbacks, the benefits overwhelmingly outweigh them, and the TCC librarians recommend LibGuides to any librarian considering redesigning a main library homepage or full website. Using LibGuides to maintain the TCC Libraries website has been an asset to the library web presence. It allows librarians to maintain control, rather than non-librarian web development staff. It is easy to use and does not require advanced coding skills, although code can enhance the page. The ease of updating allows librarians to rapidly respond to the needs of the community, and Springshare provides support quickly should problems arise along the way. TCC librarians chose to use LibGuides because the libraries already used the LibGuides platform and other products made by Springshare. This synergy made it a natural fit to use for the website. However, for libraries that do not use LibGuides or that want other options, there are other platforms that offer similar ease of use to design a website without advanced coding knowledge. Platforms such as WordPress and Google Sites are viable options for designing new, functional websites that can showcase the library’s services and can be quickly and easily updated by administrators. Any of these options can be used to make the website a stepping stone to student success rather than a stumbling block for frustrated students. A. Garrison Libby (alibby@tcc.edu) is a Reference Librarian at Tidewater Community College. Joy L. Yaeger is a former Reference Librarian at Tidewater Community College. © Authors: A. Garrison Libby and Joy L. Yaeger. This article is distributed under the terms of the Creative Commons Attribution 4.0 International License (https://creativecommons.org/licenses/by/4.0/), distribution, and reproduction in any medium, provided you give appropriate credit to the original author(s) and the source. 1 “Libraries of Tidewater Community College – Library Page,” Tidewater Community College. Last Modified August 11, 2017. Accessed September 3, 2017. http://libguides.tcc.edu/LibraryPage. 2 “LibGuides – Content Management and Creation Platform for Libraries,” Springshare. Accessed September 3, 2017. https://www.springshare.com/libguides/.